Mike Kuniavsky’s Smart Things 2011. Thanks for watching. Welcome your comments. In this design, a smart home system is proposed with the ideas similar to the App Store for smartphone. After purchasing the specific package, people can download the Apps, tune the functions, and upload them to the store. With this family’s edition, the customers can download the agents from the Apps Store to learn each member’s behaviors. Then, these agents will interact with the smart devices to help set up the personal preferences. Moreover, when the agents detect possible conflicts to the other users, they will help to negotiate. If they cannot reach an agreement on the settings, the system will invite the users to discuss and select the proper choices. Besides, the agents can also help to track pets’ activities, play the music, and create the right ambiences. With Apps4Home by their side, life at home is better than ever. In this design, an Apps for Home concept is proposed. People can choose & purchase the specific packages and download the Apps for their home. For example, the parents can purchase the Kid’s edition to dynamically adjust the environment for fitting his playing. It can also help to manage daily ritual and routine, such as bedtime storytelling or the morning rush. Through the collaboration of multiple machines and internet services, the smart home is able to enrichinhabitants’ indoor activities and improve their living quality. Reading “Perceptive Qualities in Interaction Design"
Deckers, E. J. L. (2013). Perceptive Qualities in Systems of Interactive Products (Doctoral Dissertation). Eindhoven University of Technology, Eindhoven, the Netherlands. I started to wonder if the phenomenon of perceptual crossing –I perceive you perceiving me and you perceive me perceiving you– could also happen between person and artefact. I focused on inter-subjective interaction. Why do we feel involved, or not, in a situation? The initial focus was on how perception, in mediated social interaction, gets emotional value through the use of an object. My focus shifted from mediated to direct interaction. How can a person who perceives tactually, perceive the perceptive activities of a person who perceives dominantly visually? I investigated whether and how to design for perceptive qualities in systems of interactive products from a phenomenological point of view. I am convinced that if we want to design for successful intelligent systems that are perceptible to and evolve around its user, the artefact’s intelligence has to build on the direct interaction with its user(s). Martin Heidegger, a student of Husserl, stressed the role of the body. Central to Heidegger’s work is his notion of ‘Dasein’, meaning that we actually are in the world and this is the only way to experience the world. We understand the world in terms of possibilities, and the world itself is always a structural component of ‘being in the world’ or ‘Dasein’ (Dourish 2001, p. 108). Objects in this world are presented to us as ‘present at hand’ (vorhanden) or ‘ready at hand’ (zuhanden), describing the relation between person and artefact. When ‘present at hand’, we perceive the object as it is in the world, the body-image. When ‘ready at hand’, we perceive the object not longer as it is, but we ‘care’ for it and establish a relation in which the object becomes a tool (zeug). The hammer lying on the table is an object in space; when ‘ready at hand’ the hammer is an extension of my body. Glasses on someone’s nose are glasses, but are part of my body when they improve my seeing (Heidegger, 1927). By considering perception as the affordances the world reveals to us, perception becomes a very active and personal matter. Perception can only be valuable to us if we undertake appropriate and effective actions in relation to the environment (Merleau-Ponty, 1945/2009, p. 107). And, in turn, our actions should be guided by an accurate perception of the environment for them to be appropriate and effective (Michaels & Carello, 1981, p. 47). To experience the surface of the table top I will not just touch it but also move my fingers over it in an exploratory fashion. In a similar way, our eyes are always in action to perceive (micro-saccadic movements of the eyes) and when immobilised we are not longer able to see (Ditchburn, 1973; Steinman et al., 1990, cited in Lenay et al., 2007). Perception is active: I and the world are both part of it. It is ‘out there’: in front of me (Figure 3). Figure 1. Perception is considered the result of the actions a subject undertakes towards an event and the sensory feedback she receives, and the other way around. The discussion of Merleau-Ponty’s (1945) investigations brings forward that perception is inherently interactive and participatory. Perception is an active, reciprocal interplay between the perceiver and the perceived (Abram, 1996, p. 89). Our direct sensorial experience, our direct perception, is only meaningful because of its reciprocal nature. We are only able to touch because our body is a touchable thing; to touch is also to feel oneself being touched. To see is also to feel oneself being seen. In the phenomenological description of the body of a subject, two aspects are described. The lived-body is the body as we experience it; it is our ability to perceive. The body-as-an-image is, as it were, the object we are in space; our physical appearance to others (Lenay, 2010). It is in the reciprocal nature of perception that I recognise others as intentional subjects, that I distinguish their lived-body from their body-as-an-image, and that the other recognises my presence as intentional subject. This phenomenon, called perceptual crossing, is the interplay of perceiving while being perceived. In simpler words: I can see you seeing me and you can see me seeing you. We attract and escape from each other’s perception. We catch each other’s sight to let go of it again; our perception of each other crosses. We share a common space in which we can build a history in the course of our interaction (Lenay, 2010). This constitution of the other’s viewpoint is essential to get a feeling of sharing the common space: to feel involved. The beauty in the phenomenon of perceptual crossing is that I experience my own intentionality; it shows me that I affect the sensitivity of the other. It shows me I am involved in the situation. When I touch, I discover I am touchable and when your eyes catch mine I understand that I am seeing. I cannot perceive my own body in the way I perceive that of others. I might perceive the tip of my nose, but I do not see my own face, my own eyes (Merleau-Ponty, 2009, p. 152). In the other’s perceptive activity I recognise that I affect the sensitivity of the other person. And it is the other’s perceptive activity that shows me that the environment affects her sensitivity. These phenomena are respectively referred to as primary and secondary inter-subjectivity (Gallagher and Zahavi, p. 187). When we engage in perceptual crossing this reassures us of ourselves, and we can feel involved with the other and the situation we are in. We all experience how weird it can feel when laughing out loud with no one else present. Or how a mirror urges you to look at yourself. You get vulnerable in situations where you are not aware of your own body. There is nothing more sincere than a child playing without her knowing she is being watched. The child does not see herself as long as perceptual crossing does not occur, and you understand that what the child expresses is not under her control and is therefore sincere (Lenay, 2010). In the reciprocity of our perception of each other we share this vulnerability which makes the moment that we touch or catch each other’s eyes so powerful. 1. 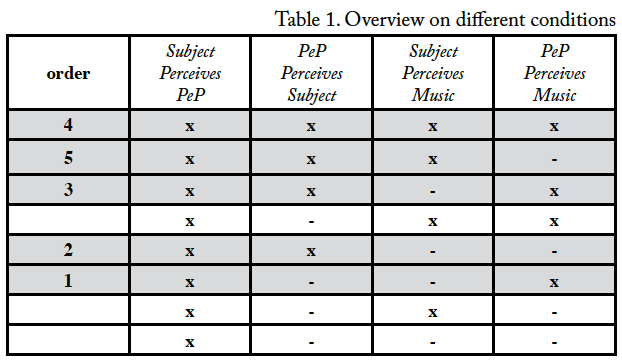 Descriptive theoretical model on perceptual crossing between two subjects. 2. Descriptive theoretical model on perceptual crossing between two subjects, their common space is sketched by their perception of an external event. Perceiving presence: refers to perceiving the other’s ability to perceive, to the presence of the lived-body. Even if the other has not yet perceived me, I perceive her intentionality in the way she is engaged with the environment, how she affects it and how it affects her (referred to as partial perceptual crossing: Lenay, 2010). Perceiving perceptive actions is the perception of the exploratory actions the other undertakes to perceive me and our common space. These perceptive actions, like looking in my direction, turning your ear towards the acoustic event or moving the finger in exploratory fashion over the table top to discover the surface, tell us what the other perceives. Perceiving expressivity: The other’s expressivity is also in these perceptive actions. By perceiving each other’s expressivity we come to appreciate how the other feels or thinks about what she perceives. If the other rubs a surface to the sensitive skin of the cheek, this reveals to me that the surface feels soft or pleasant. By designing perceptive qualities in the artefact, person and artefact hypothetically are able to engage in a rich reciprocal interplay of perceiving and being perceived. Perceptive qualities refer to the qualities of activity and sensing that allow for a reciprocal interplay and engagement with others and with the world. Perceptual crossing happens between them, and they share their perception of their common space. They can build a common history which positively influences the person’s feeling of involvement. In the course of their interaction, they come to appreciate each other’s viewpoint; they appreciate that they affect each other. The intelligence of the artefact is built in the course of this interaction. PeP and its successors are research artefacts that are deliberately designed to investigate whether and how to design for perceptual crossing between person and artefact. The physical body of PeP (body-as-an-image) is a purple square pillar (200mm x 200mm x 1020mm). The square shape is a deliberate choice, as it gives the person interacting a clear position towards the artefact. Accordingly, one light sensor (Light-Dependent Resistor) is placed on each side. In the top surface, thirteen LEDs (Light-Emitting Diodes) are evenly placed in a five-to-five grid. The perceptive body of PeP is reflected in the LED grid, and the dynamic qualities overtake the physical shape. This light body is PeP’s perceptive body, and the purple pillar functions as a container for this dynamic light design. In an experiment I evaluate the influence of the designed perceptive qualities on the interaction and the person’s experience. These qualities were further defined in components of perceptive activity. The general hypothesis is that when person and artefact are able to engage in a rich reciprocal perceptive interplay and share their perception of the event, the feeling of involvement of the person increases. The feeling of involvement in situation 4 is greater than in situation 5. The results could be represented as Situation 4> 5 > 2 > 3 > 1 significantly (p<0.001). Situation 4 is the richest in terms of interactive qualities. In situation 3, the feeling of involvement significantly differs from the feeling of involvement in situation 2, but participants feel less involved in situation 3, contradictory to sub-hypothesis 2. 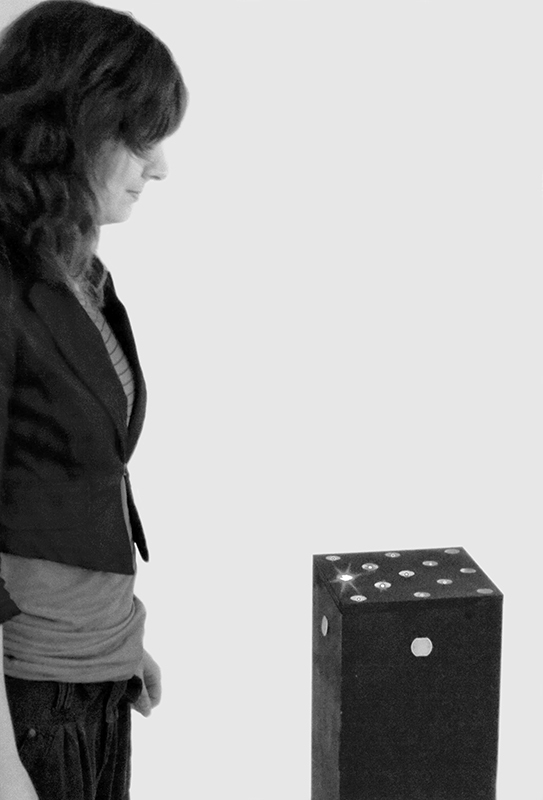 The participant can experience perceptual crossing in situation 3, but does not perceive the external event that PeP perceives. 在 WordPress.com 建立免費網站或網誌. 樣版: Enterprise.